Often, when I decide to post information on this website, it’s in response to comments I’ve read on other lupus blogs. Today I write about an aspect of lupus that affects me, although my research suggests the syndrome I experience may have implications for many other lupus patients. Anyone familiar with my website likely knows that one manifestation of lupus I experience is gastrointestinal (GI) inflammation. GI complaints are among the most frequent reported by lupus patients; these GI issues are usually believed to be a side effect of medication. However, an interesting study looked at autopsies performed on lupus patients (Takeno M, Ishigatsubo Y. Intestinal manifestations in systemic lupus erythematosus. Intern Med. 2006;45:41–42) and found that 60 to 70 % of those examined showed evidence of peritonitis, although only 10% of these subjects had been diagnosed with the condition before their deaths. According to an article in the World Journal of Gastroenterology , the incidence of gastrointestinal lupus may be underestimated because the symptoms are indistinct and there is generally no specific antibody associated with the syndrome. Among the kinds of GI lupus mentioned in the World Journal article are: vasculitis; thrombosis and pancreatitis. Less common forms of GI lupus are: intestinal pseudo obstruction; inflammatory bowel disease; and celiac disease. In my case, exact diagnosis remains speculative, though it is clear I have in the past had at least one episode of acute pancreatitis and one episode of acute inflammation of the small bowel. In both instances CT images revealed the presence of ascites (excess fluid in the abdomen). I have gone through enough acute abdominal episodes to recognize signs of an attack when it is imminent. One thing consistent in each event is that I am beset with acute anxiety, almost with a sense of doom. Another thing that happens, as the attack progresses, is that I shiver. This last “sign” I find particularly perplexing, because usually there is no obvious reason for me to feel cold–and yet I shiver. My inclination has been to write the anxiety off as experience-based: I’m afraid I’ll have to go to the hospital and I don’t know what will happen to me. But the shivering has never made sense to me. Until a couple of weeks ago. That’s when I began to investigate the gut/brain connection. Since then I’ve learned about the vagus nerve, which is the longest nerve in the body and which forms a direct link between the gut (and other viscera) and the hypothalamus. The hypothalamus sits at the base of the brain and is in charge of a whole bunch of things, including many involuntary responses. One of these responses is shivering. The hypothalamus also plays a significant role in emotions. It, and other parts of the brain, are tied into the limbic system. According to a paper that came out of the Columbia University Medical Center, “Emotional responses modulate the autonomic nervous system to respond to threatening stimuli or situations…” and “…the hypothalamus and limbic system mediate these behaviors.” In other words, a perceived crisis may trigger the hypothalamus to set in motion a series of involuntary responses. One of these responses is shivering. As I continued to read about the gut/brain connection, I began to understand more about the way these two parts of the body communicate with each other. Apparently, one of the ways we know we are full, when we eat, is because the vagus nerve transmits information to the brain; it informs the brain that certain changes have taken place in the gut . It also lets the brain know when the gut is in trouble. This process is described in an article I found on scholarpedia.com: Autonomic Nervous System. The article states: …”Different… classes of…nerves respond to inflammation or damage to the gut wall”. The message of distress triggers a reaction in the autonomic nervous system. As I reached this point in my research I began to get a handle on the cascade of events that ensue from acute GI inflammation. The Vagus nerve is like a train that carries information from the gut to the brain and from the brain to the gut. A gut in trouble will communicate the emergency to the brain. 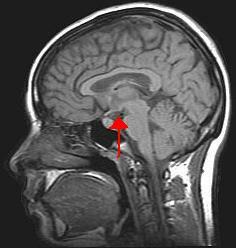 The hypothalamus, nested deep in the brain, is a terminus which receives the emergency bulletin from the gut, via the vagus nerve. The hypothalamus reacts–it seeks to reestablish homeostasis (return to normal). It releases powerful chemicals into the system, which increase anxiety; the effort to achieve homeostasis also triggers shivering–possibly to raise body temperature, which has likely been lowered as a result of dehydration. If the results of the study cited in the World Journal of Gastroenterology (see paragraph 1, above) are correct, then a high percentage of people with systemic lupus experience gut inflammation. And if this is true, it is something that perhaps both patients and doctors should keep in mind. And perhaps, as they do, they may consider the strong effect that changes in the gut can exert on emotional status (see:Think Twice: How the Gut’s “Second Brain” Influences Mood and Well-Being, from Scientific American, 2004). By aglupuswriter in Uncategorized on February 10, 2015 . Thank you so much for your post. I can tell you are dedicated to find out more about the disease. Thank you for your dedication. I have had Systemic Lupus since December 2010. It has been under control for several years. However, the past two years, I have experienced GI issues. Can’t digest food normally, getting full after one or two bites of food, nausea, vomiting, weight loss, loss of appetite, the list goes on. I try to stay encouraged, but today is really hard. I just want to be normal again. I am sorry. The gut issues can dominate your days. I am just now coming out of a tough bout. I hope you make sure your medication is appropriate and at sufficient levels. A good doctor and maybe the advice of a nutritionist may help you to manage the symptoms. Often, the gut is overlooked as a major symptom of lupus. I hope the situation improves.